Enhancing the legacy created by models like Cayenne GTS, Panamera GTS, Cayman GTS and Boxster, Porsche introduced a new member in its GTS team. We are here talking about the Porsche 911 Carrera 4 GTS 2015 which gets series of features accompanied by better power efficiency to mark new standards on street. 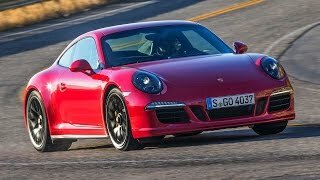 Let us have a look at the review of Porsche 911 Carrera 4 GTS 2015 to know more about this new member in family. There isn’t much of change when you move to the interior of Porsche 911 Carrera 4 GTS 2015. However to make it unique the leather wrapped seats gets accompanied by Alcantara trim, satellite navigation and few extra goodies. The list of extra features includes Porsche Active Suspension Management, Porsche Torque Vectoring, Porsche Stability Management and Porsche Vehicle tracking anti-theft system. Not only this the list further extends and compliments the comfort and luxury with blend of infotainment and entertainment with the seven-inch touch screen Porsche Communication Management with satellite navigation, digital radio , universal audio interface that comes with MP3 Connectivity. In all we found the interior of Porsche 911 Carrera 4 GTS 2015 well blended with amalgamation of tech, innovation, comfort and luxury. The exterior of Porsche 911 Carrera 4 GTS 2015 indeed separates it from the line-up it joins, let that be then about the Coupe or Cabriolet models. Starting with the front fascia, you’ll notice special trim elements accompanying the bi-xenon headlamps. Porsche 911 Carrera 4 GTS nose gets a bit sloppy touch while the wide track looks more aggressive with those flared wheel arches covering the 20-inch wheels. Moving towards the rear fascia of Porsche 911 Carrera 4 GTS, the black highlighted trim splatters bit of aggression. The same gets enhanced when bespoke air intake screen and black-chrome exhaust pipes mark their presence. In all, the parts creating exterior of Porsche 911 Carrera 4 GTS 2015 looks both luxurious and aggressive when accompanied with the lowered height. 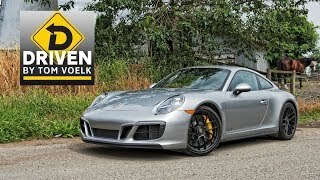 The engine beneath the Porsche 911 Carrera 4 GTS 2015 hood is a 3.8 Liter flat-six engine generating total output of 430 hp and with its PDK transmission enables the Porsche 911 Carrera 4 GTS 2015 to reach top speed of 198 mph. Each of the models, Coupe and Cabriolet come paired to seven-Speed manual transmission with an option to go for PDK Dual-Clutch transmission.